being able to enjoy nature’s gifts and spending time with family and friends are the keys to a memorable hunt. For many years, the enjoyment, fulfillment and overall emotions of that day are shared through photographs and the memories of the people that experienced it. When I was a young boy, barely able to walk, my father would strap me on his back, taking me through the tall grasses and vast, wide-open plains of Kansas, searching for signs of deer, pheasant and possible goose/duck hunting spots for the upcoming season. Throughout my childhood, my dad and I put on some miles creating thousands of memories that we both will always cherish and never forget. Besides having the memories, we would always end with a photograph. As the years went by and the stack of pictures grew to an outrageous amount, my father had discovered another option to enjoy and share our memories together. This was through a video camera. 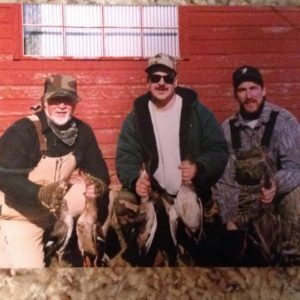 So, after I was old enough to get my hunter safety license, my dad already accumulated a stack of video cassette tapes, filled all of his duck hunts he shared with his two favorite hunting buddies from Kansas. Nothing would compare to reliving, seeing, and feeling the emotion the moment one of those videocassette tapes played. It puts you right back into that hunt, hearing the laughter, jokes and funny moments spread around the duck blind or tree stand. This lead to both my dad and I being committed to, not only bringing the essential hunting gear to the blind, but to also lugging the video camera so we could have the opportunity to relive and document our hunting adventures together. Well, now having over ten years of hunting adventures and a lot funny moments documented, you could say the memories of viewing these hunts are always going to be something special. But, for us, the funny moments and adventures were an added bonus. 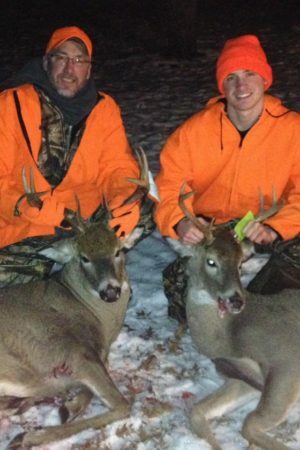 My dad and I are very avid hunters and outdoorsmen. I was born and raised around hunting and fishing. I was taught to respect the land and given the knowledge to appreciate everything that lives within it. Being ethical hunters is something my dad had ingrained in us from the generations of hunters in the family. We are always pushing ourselves to become better outdoorsman and, through that, we are always up for a challenge. Having the opportunity to hunt with a camera at our side, my dad and I always loved the challenge it brought to the table, in all sorts of different hunting situations. Being a bowhunter, the challenge of the hunt is very tough, with all sorts of factors. The most important factor in any hunting situation is movement. You need to have knowledge and skill to drawback and move, when necessary, in order to become successful. But, using a camcorder adds a whole new level to the challenge of bowhunting. Not only do you have the challenge of drawing back and moving yourself around the blind or stand, when necessary, but you have a camcorder that you have to make sure you turn on, hit record, as well as move, in order to orientate it in the right direction to capture that moment on film. But, if you are successful, the outcome of reliving that moment will always be there for as long as you live. Capturing that moment is also a very helpful tool in the world of bowhunting. Both of us have benefited greatly by having the ability to replay the footage of the shot to identify where the shot placement was and determine how long to wait to recover the animal. There will always be times when a hunter is unsure of a shot; but having a tool like a camcorder to review and playback, as many times as you want, greatly increases your chance of making the right decision to pursue or wait on the animal. 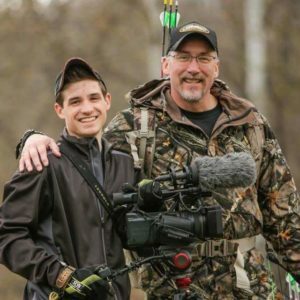 having the ability to use a camcorder as a tool, and having the ability to relive those moments in an interactive, more personal way is something that every hunter should look into and consider. I will always take my camcorder into the stand with me. I will be able to relive those moments and be able to share them with my kids someday; which, for me, is something way more important than showing them just a picture. Despite the added challenge to the hunt, lugging the camcorder provides the ability to capture the memories, moments, and raw emotion on camera. This is something that will always appeal to both my dad and I. People say pictures are worth a thousand words, but a hunter’s video clips are priceless. For any hunter taking the leap into the world of video, here are my words of advice; don’t forget to hit record!